Kokomo High School girls basketball state champion coach and 2008 Howard County Sports Hall of Fame inductee Mike McCroskey is a legend. And now the legend will join a class of 11 women and men who have made significant contributions to Indiana high school basketball as they will be welcomed as the 11th women’s induction class to Indiana Basketball Hall of Fame in New Castle. Including players and head coaches who won IHSAA state championships, the class is comprised of successful Indiana high school coaches and players who attained individual and team success throughout the state tournament and participating in the Indiana-Kentucky All-Star series, all hallmarks of the rich Indiana high school basketball tradition. All have also left their marks with successful careers in college and in their respective lives off the court. Joining McCroskey in the 2012 induction class of the Indiana Basketball Hall of Fame are Shelly (Brand) Adlard, Evansville Reitz, 1981; Stan Benge, Ben Davis, 1972; Anita (Folk) George, Warsaw, 1978; Linda Godby, Warren Central, 1986; Amy Lynn Hile, Fort Wayne Dwenger, 1983; Bob Kirkhoff, Cathedral, 1953; Audrey (Baines) Moore, Jeffersonville, 1976; Sue Parrish, Marion, 1963; and Judy Burns Powell, Marion, 1981. The St. Vincent Health Silver Medal Award will go to Sharon Roberts, New Castle, 1961. McCroskey led his alma mater Wildkats to back-to-back single-class girls basketball state championships in 1992 and 1993 and a state runner-up finish in 1994. In 27 years of coaching, his teams at Haworth (41 wins, 25 losses), Kokomo (227-82), Northwestern (78-36) and Carroll (68-33) high schools have won 414 games with his current Carroll team standing at 7-4 with three sectional titles in four seasons. A 1968 Kokomo graduate, McCroskey returned to his hometown and earned his coaching stripes at Bon Air Middle School as a seventh grade coach before being named the coach of the Haworth Lady Huskies in 1980. His first Husky team finished with just a single win, but he followed that with winning seasons of 9-7, 15-3 and 19-3 and was named the first coach of the combined Kokomo and Haworth high schools. In his first year as the Lady Kats coach in 1984-1985, he led the squad to its second sectional title and first-ever regional championship. As any Lady Wildkat fan knows, McCroskey saw his greatest success at Kokomo, where in 13 years of leading the Lady Kats, he compiled a girls basketball school record 227 wins for a .735 winning percentage. Along with the pair of state titles, his Lady Kats won 12 sectionals, seven regionals, four semi-states and were ranked No. 1 in the United States during the 1993 state title season. 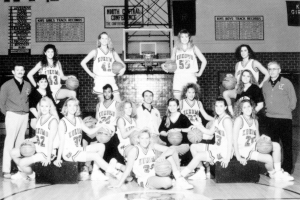 From 1990-1994 – during the height of the Lady Kats success – Kokomo was a sensational 117-10 under his guidance. In addition to 17 overall sectional championships (one at Haworth, 12 at Kokomo, one at Northwestern and three at Carroll), seven regionals and four semi-states, he was named the 1992 and 1993 coach of the year by the Indiana Coaches of Girls Sports Association and by the Indiana Basketball Coaches Association. He coached the Indiana All-Star team against Kentucky in 1994 and coached five Indiana All-Star players – including 1993 All-Star and the all-time leading scorer in Kokomo High School basketball history (boys and girls) Tiffany Longworth. His other Indiana All-Star players include Mistina Oliver (1993), Cari Stover (1993), Debbie Benzinger (1994) and Tamie Stiner (1997). Longworth (1,936 career points), Benzinger (1,479), Oliver (1,174) and Stiner (1,007) all rank in the top ten of Lady Wildkats all-time leading scorers, with Longworth and Benzinger standing in the top two positions. His squads made four appearances in the IHSAA girls basketball single-class Final Four and many still consider McCroskey the best coach Kokomo High School has ever seen in any sport. He took a program that won 88 games in 10 seasons to success beyond what anyone expected – he made it a championship program and the envy of the entire state. The Indiana Basketball Hall of Fame’s Annual Women’s Awards Banquet will be held on April 28, 2012. The ceremony will take place at the Primo South Banquet and Conference Center which is located on the south side of Indianapolis. Tickets are still available for the event. Call the Indiana Basketball Hall of Fame at 765-529-1891 for more information. For more information on the entire 11th women’s class of the Indiana Basketball Hall of Fame, see the Dec. 27, 2011 edition of the Sports Journal. This entry was posted in Basketball, IHSAA, Kokomo, Lady Kats, Northwestern, Sectionals, Tournament, Wildkats. Bookmark the permalink.